Rewards Canada: Kaligo Black Friday Bonus: 50% Bonus Miles/Points on all hotel stays booked by November 27! Kaligo Black Friday Bonus: 50% Bonus Miles/Points on all hotel stays booked by November 27! A great way to boost your balances for stays at non-chain hotels or even at chains that aren't your regular cup of tea is booking via third party hotel sites like Kaligo. 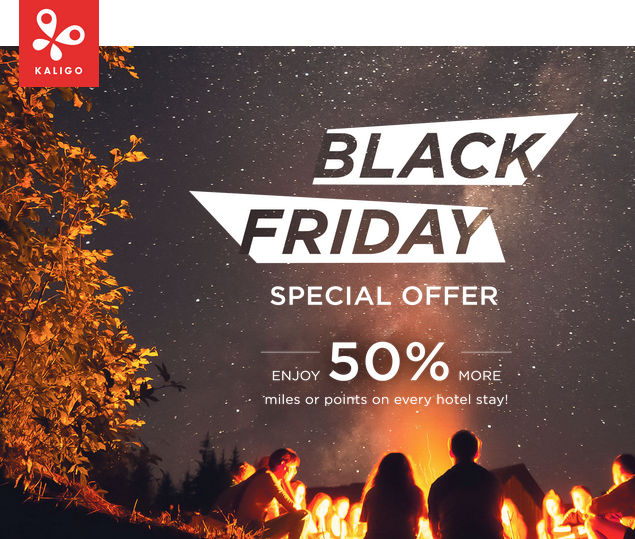 Right now you can get even more miles or points for Kaligo bookings with their Black Friday Sale that offers a 50% bonus! For most our readers I imagine you'll funnel these stays into Alaska Airlines, British Airways or United but there are lots of offer options as well!